Lenovo’s powerful 8-socket x3950 X6 server using Intel Xeon E7-8894 v4 processors on Windows delivers more than 28% performance improvement over the previous-generation Lenovo system and 4% improvement over E7-8890 v4 processors for the SAP SD 2-tier standard application benchmark. This document summarizes the SAP SD benchmark result for the System x3950 X6 that was published on 7 February, 2017. The document lists the result, summarizes the major components of the configuration under test, and provides the link to the relevant benchmark organization’s web site for details about the result. Lenovo’s 8-Socket x3950 X6 server using Intel Xeon E7-8894 v4 processors delivers 28% performance improvement (2) over the previous-generation Lenovo system and 4% improvement over E7-8890 v4 processors (4) for the SAP sales and distribution (SD) 2-tier standard application benchmark (1) in Windows environment. February 7, 2017 ... Today Lenovo announced an outstanding 8-processor result on Windows for the two-tier SAP sales and distribution (SD) standard application benchmark (3). The result was achieved on the Lenovo System x3950 X6, configured with 8 Intel Xeon processors, using IBM DB2 10.1 and SAP enhancement package 5 for the SAP ERP application release 6.0. The Lenovo System x3950 X6 is an 8-socket, 8U rack server, designed for maximum performance and up-time for applications and cloud deployments. The X6 solution provides a powerful platform for mission-critical SAP Business Suite applications, one that is ideal for customers who are looking for reliability, manageability and scalability with the flexibility to run Windows or Linux. Integrating hardware, software and memory advancements, the X6 enterprise servers are designed to be fast, agile and resilient. Results referenced are current as of February 7, 2017. For the latest SAP benchmark results, visit: http://www.sap.com/benchmark. (1) This benchmark fully complies with the SAP Benchmark Council regulations and has been audited and certified by SAP SE (certification number 2017002). Details can be obtained from Lenovo and SAP. The benchmark was performed at Lenovo Data Center Performance Lab in Research Triangle Park, NC, USA, by Lenovo engineers. (2) The claim of achieving 28% percent improvement in performance is based on results on the two-tier SAP SD standard application benchmark achieved by Lenovo System x3950 X6 (8 processors, 144 cores, 288 threads) on the Intel Xeon Processor E7-8890 v3, 2.5 GHz, 45 MB L3 cache per processor. 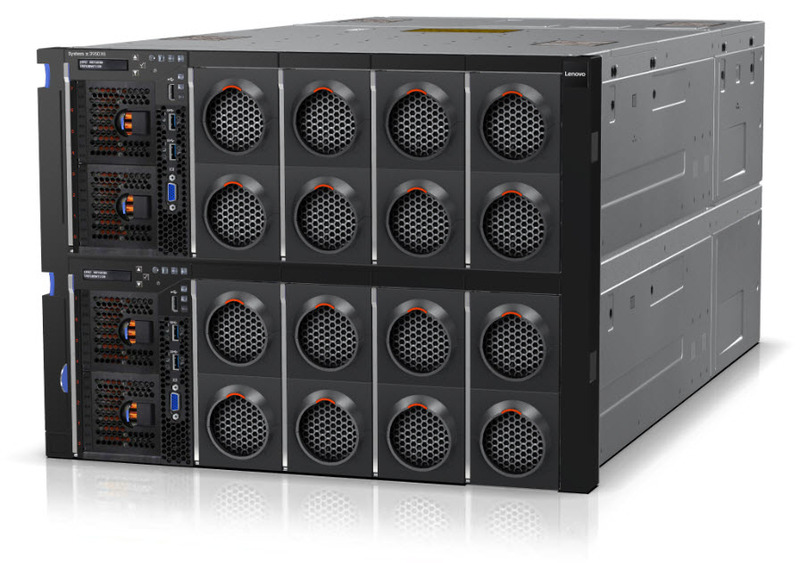 The Lenovo System x3950 X6 achieved 60,000 SAP SD benchmark users with 0.88 seconds average dialog response time, 330,930 SAP Application Performance Standard (SAPS) values, measured throughput of 19,856,000 dialog steps per hour (or 6,618,670 fully business processed line items per hour), and an average CPU utilization of 98% for the central server. Details are provided in Certification number 2015041. (3) SAP SD benchmark is a test for standard sale and distribution business components on SAP ERP, which is indicative of the performance of the application and database on a specific hardware environment. (4) Lenovo had achieved the leadership result for SAP SD 2-tier benchmark on x3950 X6 using eight Intel Xeon E7-8890 v4 processors. Details are provided in Certification number 2016045.